Ugg boots are a unisex style of sheepskin footwear that boasts of fleece on the inside, a tanned outer surface, and a synthetic sole. The unique hides and furs that Uggs are made out of require special cleaning to ensure 100% effective stain removal, weather protection, hole reparation, and odor elimination. At Love your Leather, we have developed and mastered a highly complex Ugg cleaning process to provide you with the best Ugg boot cleaning service. We ensure your precious Uggs remain in excellent condition and last for many years. With all the rain, snow, sleet, and salt that we can often find ourselves walking in during the winter, it’s imperative that we give our prized footwear the care they deserves! Our Love Guard technology protects Ugg boots from weather elements and is specifically formulated for sheep and cow suedes. Unlike other Ugg cleaners, we only use eco-friendly, biodegradable cleaning solutions to prevent off-gassing that harms the ozone layers. Our color restoration formulation pumps color back into your Uggs and ensures it is fastened to the surface, so you don't need to worry about it rubbing off on your clothes or about the touch and flexibility of the leather being compromised. You can always count on Love Your Leather. Your valuable designer Uggs boots are in the best hands. We are dedicated to providing outstanding Ugg boot care and services across Canada. 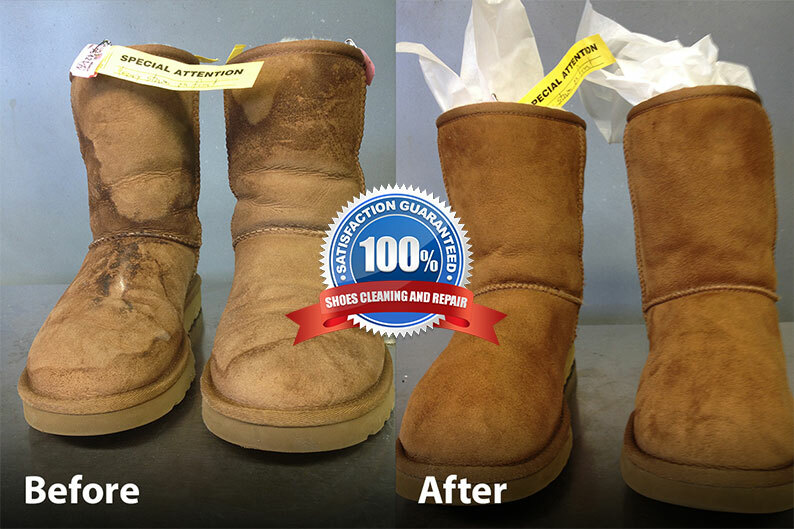 Simply scroll through the above photos to see just how incredible our professional Ugg cleaning technology is! Client satisfaction is our number one priority. Your uggs are restored in our state-of-the-art 10,000 sq. ft. Ugg cleaning Toronto facility. 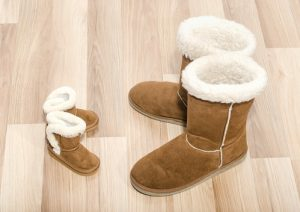 Typically, it takes just one week for your Ugg boots to look as good as new after receiving the royal treatment of our top tier ugg boot cleaning services! Get Our Experts to Clean Your Uggs! Our professional Ugg boot cleaning technology removes all stain types from your boot hide. We also have a special proprietary pigment formulation for Ugg color restoration. Ozoning kills bacteria that causes foul odor & bacteria. To restore your boot fur to original condition, we use state of the art ozone machines to clean and deodorize your Ugg boots without causing any damage. We have developed proprietary tooling techniques and procedures to remove scratches and holes from your ugg boot hide. To accommodate our clients, we offer complimentary pickup and drop-off in locations near our catchment area. Our drivers can reach everywhere between London, Ontario to Ottawa, Ontario including the Greater Toronto Area each week! Southwestern Ontario cities included within this pickup area are: Acton, Barrie, Bolton, Bracebridge, Bradford, Brampton, Brantford, Burlington, Chatham, Collingwood, Georgetown, Guelph, Hamilton, Kingston, Kitchener-Cambridge-Waterloo, Lindsay, London, Markham, Milton, Mississauga, Newmarket, Oakville, Orangeville, Oshawa, Ottawa-Gatineau, Owen Sound, Peterborough, Richmond Hill, St. Catharines - Niagara, Stouffville, Stratford, Sudbury, Toronto, Vaughan, Woodbridge, Woodstock, and Whitechurch. We serveall of Southern Ontario, and are headquartered in downtown Toronto. Our pricing is customized based on the extent of cleaning that is requiredtore store your Uggs to mint condition! You can submit your Ugg images via our online quote and you will get a quote with in 24hours. Do you offer Express Cleaning Services? Typically, it takes one week after drop-off for your Uggs to look brand new! However, depending on the day, we may be able to offer speedy service. Please feel free to call us to know more about express Ugg boot cleaning or if you have any queries regarding how to cleanuggs? What happens if I’m not pleased with the results? At Love your Leather, customer satisfaction is our top priority. 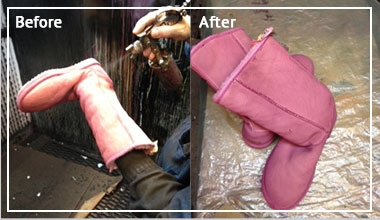 If you are unhappy with our Ugg boot cleaning services, we will provide a full refund. Can you get salt stains out of uggs? Are you wondering how to remove salt stains from uggs? Don't worry, we at Love your Leather have advanced stain removal technology that is specialized in removing salt stains out of uggs. In addition to this, we also have experts who know how to clean ugg boots to make them look brand new. Can I get water stains out of uggs? Worried about how to get water stains out of uggs? Love your Leather has experts who have years of experience in removing water stains from uggs. What kind of stains can be cleaned using your ugg boot cleaning service? Confused about how to wash ugg boots with food stains, motor oil, gasoline or water mineral? Love Your Leather can completely remove any kind of stains from uggs using our proprietary tooling techniques and procedures. How long will it take you to clean ugg boots? We can deliver your ugg boots with in one week. 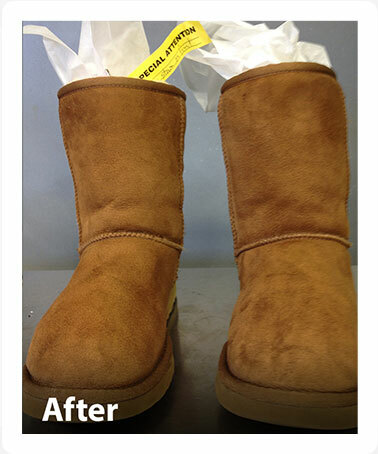 We put your uggs through our thorough procedure to make it look as good as new.